By Tali Krakowsky . Published on December 16, 2009. Last week, while strolling through the galleries of Los Angeles' Museum of Contemporary Art's First Thirty Years exhibit, I rediscovered Dan Flavin. 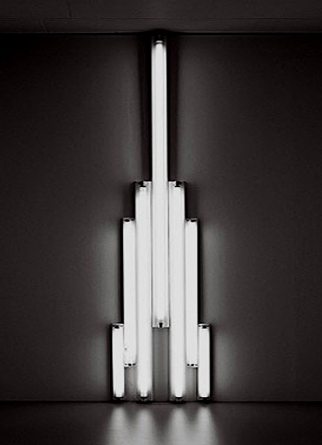 It wasn't actually his "monument" for V. Tatlin (1969) that struck me as much as the description of the materials used for this piece: "cool white fluorescent light with fixture." The approach is so contemporary. He captures an important point that I think we have to continue to remember. It's not about the technology and the "stuff." Bulbs die and pixels change. It has to be about the effect and the experience. That is what makes something authentic, unique and timeless. I wanted to share with you some historical and contemporary projects that I think do just that. They are all nocturnal, plugged in and are more interested in experience than hard or soft ware. There are no scientific criteria for the selection. They are all building facades, they all deliver some kind of specific or ambient brand expression, they all seamlessly integrate technology and I like all of them for one reason or another. This is by no means a rigorous survey of all of the world's media facades. It's more of a teaser, selected at my discretion and (hopefully) for your entertainment and inspiration. All the projects are divided into two types: GLOW and PIXEL. These fabulously glowing buildings embed light into the fabric of their architecture and create a low resolution radiance that encourage us to forget their materiality and allows them to float in the night. 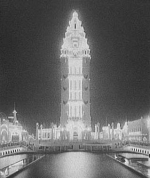 The tower of Dreamland stood 375-feet tall and was illuminated at night by 100,000 lights. 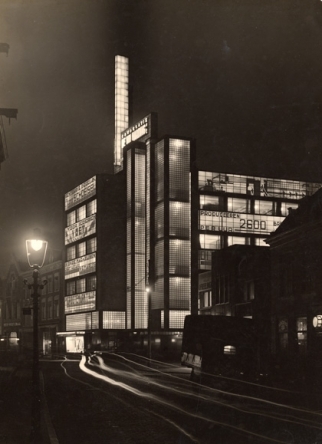 De Volharding Building by Jan Willem Eduard Buljs and Joan B. L?rsen, The Hague, 1928. Supported by a metal frame, a free-standing glass skin structure catches light within all its surfaces and distributes them in and around the galleries. This box of light is ever-changing - depending on the type of exhibition installed inside, the time of the day and the color of the sky. Turrell placed colored neon tubes in the floors between two external glass layers, within a tower that is independent of power sources and serves to showcase the capabilities of its owner, a power company. The colors reference the changes in varying temperatures that the power company provides. This natural history museum celebrated at its artifacts at night using rear-projection in its projection foil covered windows. Standing163 meters tall, this 1920s Late Gothic Revival style building, evokes Gutenberg's invention of movable type printing as a historic milestone for thought and knowledge through temporary installation of stacked typography and text. This home of the Beijing Olympics is the largest structure made of Ethylene Tetra Fluoro Ethylene, a translucent plastic-like material. ETFE allows more light and penetration than traditional glass, decreasing energy costs by 30%. A matrix of pixels is definitely an interesting canvas for dynamic high resolution content. The pixels' materials are varied, and their choreography can be driven both by pre-rendered and real-time content. Visible and dramatic or tiny and transparent, the pixel fa?ade offers great possibilities for the future. 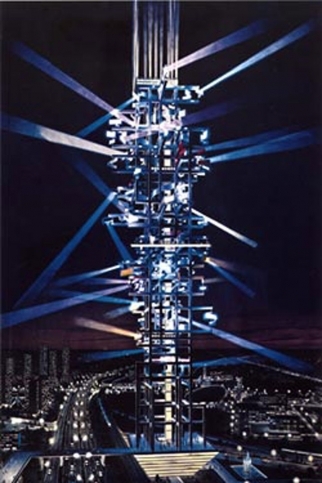 A 327-meter high Parisian performing light tower was conceived to be driven by data captured in the city, including traffic, mail, the stock exchange and temperature. 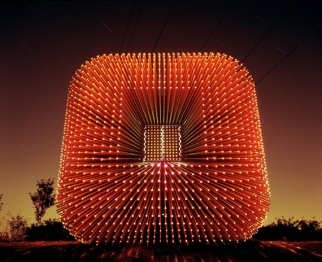 A tower of steel framework, thirty floodlights, 1,200 small light bulbs and twelve neon bands, is wrapped with perforated steel sheets to create a 70 foot tall oval column. The lights are choreographed by a computer program that captures data about external forces such as the wind (speed and direction) and noise from the street, translating it to a performance of light. 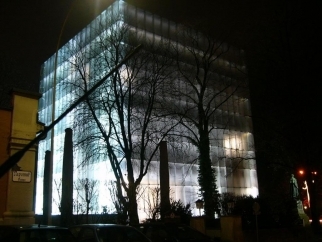 A 900m2 large media membrane made of 930 light rings is mounted beneath the acrylic glass surface of the building. 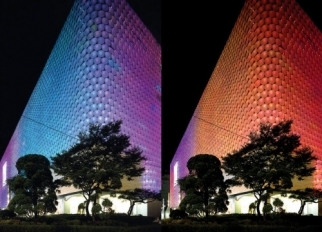 Each light is a pixel and can be controlled individually by a central computer that is able to map low-resolution images on the building, at up to a speed of 20 frames per second. 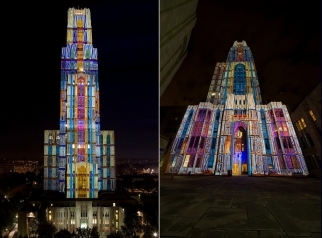 4,3000 glass discs wrapped in special dicroic foil generating a mother-of-pearl effect, are illuminated by a tapestry of LED lights that reflecting the dynamics of the weather conditions of the day through color. This seemingly transparent media-fa?ade decorates T-Mobile's headquarters in Bonn. . Over 250,000 LEDs are attached to custom-made horizontal aluminum slats that integrated the electrical components. "twists and turns" on the Uniqa Tower, Vienna from Alexander Stublić on Vimeo. 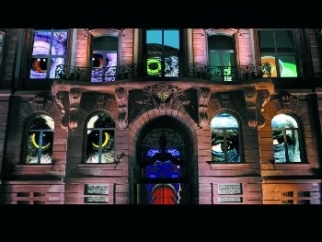 7525 square meters of LEDs are seamlessly integrated into the building's fa?ade to create a living video screen. The structure is a cube punctured by over 5000 long aluminum windows glazed with transparent orange acrylic that project light to all its surfaces from a single source. 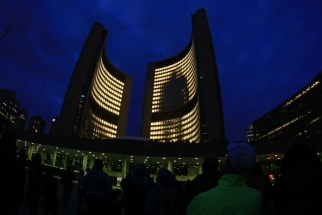 960 window lights of Toronto's City Hall towers were wirelessly controlled, creating a digital canvas for play, both for artists and passersby. This 2,200 meter media fa?ade combines photovoltaic systems with LED systems that harvest energy during the day and illuminate art content by night. 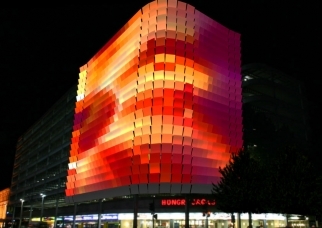 This kinetic media facade is made up of 748 programmable square panels, each illuminated by 2 LED lights. 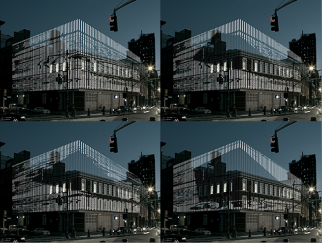 Animated vertical LED rods that at certain places even surpass the height of the building create a light fence around the fa?ade of the new Chelsea Art Museum. Dan Flavin captured it all in a caption. 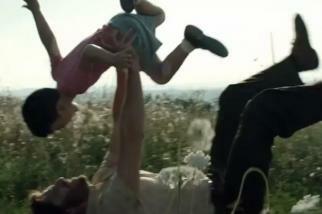 It's all about the effect and the story, not the technology.